I made my own monster eyes last year....and went a little crazy. Here is the tutorial for that process. You can buy these eyes as well, but if you make your own, it's much more affordable, and it makes enough...I should be able to will these to my imaginary kids. I can imagine there therapy bill now, "My Mom willed me meringue eyes..." It'll build character. 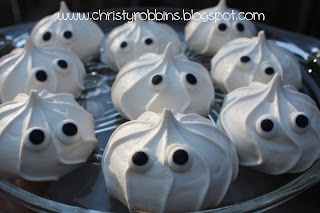 As I hunted down treats to paste those edible eyeballs to....I saw these popping up around throughout the net....but I was feeling lazy and discovered I didn't need to make my own meringues. I bought them. 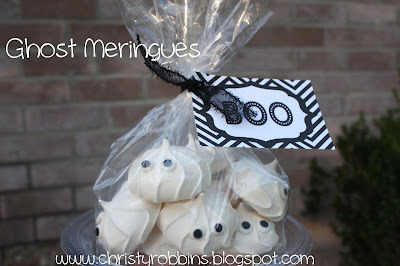 I took a little bit of white chocolate to adhere my eyes and melted it in a ziplock and snipped the edge off.